Here’s a nutrient-dense, high-fiber, super-filling, extremely-delicious kale recipe. A couple of ingredients are not on the shopping list for the week, so if you’re close to a good grocery store, try this weekend treat in place of your salad. Please always get organic or local produce. Place the chopped kale in a mixing bowl, add onion and garlic combination, scoop out avocado halves into the bowl, add salsa, lemon juice and sea salt. Mix it all up and smash your avocado gently into the mix. 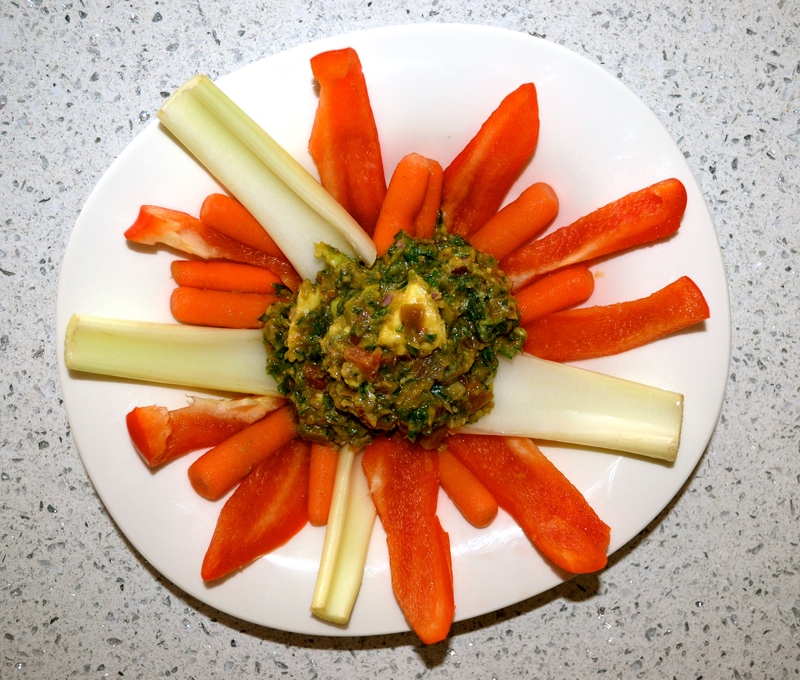 Dip celery, carrot and red bell pepper sticks into the Kale-O-Mole and enjoy! My ten year old son LOVES this recipe and that’s saying a lot considering it’s raw, mostly green and packed with healing nutrients. Please let me know what you think and how you’re doing.